Rating: 2.5/5 – Some Comics Are Best Left in The Back Issue Bin. A while back I had written a review for Atlas’ Planet of the Vampires which I enjoyed quite a bit and since then I’ve really come to appreciate Atlas Comics as a company, what they set out to do, and the wide range of titles they produced in their very short life span. My collection of Atlas books is almost complete, but I’m still missing a handful of issues including the tough to find second through fourth issues of Vicki and the third issue of Tiger-Man. As I slowly read my way through Atlas’ line of books, it does become clear on why some of their titles failed to connect with the readers of the time. 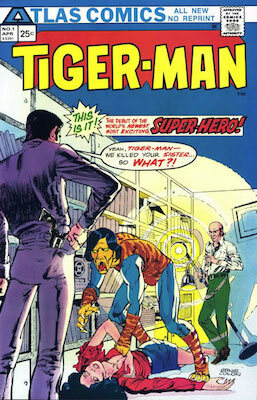 Case in point, Tiger-man number one. The cover exclaims that this is “the debut of the world’s newest, most exciting super-hero” and although Atlas thought so, in 1975 I’m not quite sure the readers did. Reading this issue forty years later I enjoyed the art by Ernie Colon, but the story fell flat for me with a hero who’s design fails spectacularly. Dr. Lancaster Hill is studying tigers at a clinic in Africa. During those studies he identifies and extrapolates the chromosome that gives the tiger its power. Wasting absolutely no time, he injects himself with it, not out of saving his life or by accident, but out of his own curiosity. That gives him the strength and speed of a tiger, which he uses to kill and maul an attacking tiger just a few panels later. For someone who respects the creature so much, seeing him maul the attacking tiger while yelling “Die, Die, Die!” seemed contradictory and extreme. As he makes his way back home a tragedy occurs within his family and he uses his newfound tiger abilities to seek his revenge. Like many of Atlas’ creations, they borrowed a lot from what was popular at the time, but their character designs definitely stood out. Iron Jaw and the Scorpion have some cool designs that hold up, but Tiger-Man’s was a miss from the start. Donning the pelt of the tiger he killed, the choice to have him wear a blue under suit makes him look a bit ridiculous. Also, although Colon’s art isn’t bad, his sequential story telling during the action scenes are confusing, and many times the characters come off as stiff which surprised me as I love Colon’s work. I also have to make mention of the lettering as I noticed it plenty of times throughout, and unfortunately not in a good way. Lots of words are underlined for effect, and it’s all the same straight capitalized font giving it a typewriter-like feel. I love the Atlas line of comics, but this one was a disappointment. A poor character design, a story with little depth and creativity, and some cheap production make this an Atlas title you should avoid. All that being said, the collector in me still wants that third issue to complete this run, and get me ever closer to completing my Atlas collection. I’m on the hunt for issue three, but although I’m on the hunt, after reading this issue I’m in no rush. This entry was posted in Atlas and tagged Atlas Comics, back issues, comic books, comics, Ernie Colon, Tiger-Man, vintage comics. Bookmark the permalink. THERE IS A COMIC BOOK INTERNET STORE (MILE HIGH COMICS) THAT HAS THE NUMBER THREE….$25.00 FOR A FAIR COPY IF YOU ARE INTERESTED. That’s a pretty high price for a Fair copy of that book.